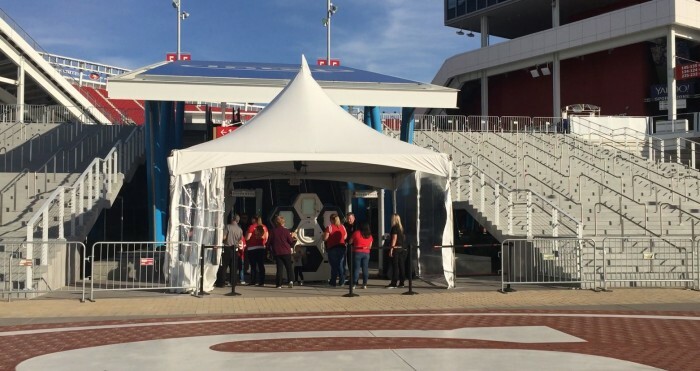 Qylur Intelligent Systems has the checkpoint of the future installed and deployed at Levi’s® Stadium one month ago with hopes the NFL approves further deployment for Super Bowl 50 just three months away. Will this security-as-a-service technology prevent the kind of suicide bomber that was blocked from entry into Stade De France national stadium during the recent Paris Attacks by ISIS terrorists? The answer is not crystal clear however last month, the company announced the signing of a Cooperative Research and Development Agreement with the U.S. Department of Homeland Security (DHS) which is sure to take on added importance in wake of the mass murder of 129 people and wounding of 352 civilian souls in France last Saturday evening at six different places throughout Paris including the friendly soccer match between Germany and France that was attended by nearly 80,000 fans including French President Francois Hollande sitting in a VIP box . The Sports Techie blog had a chat with Yair Dolev, VP Marketing and Product Management at Qylur, about their long-term collaboration with the San Francisco 49ers for football games and concerts that began with daily stadium tours at Gate A as the company pushes into the U.S. market. This marks our fourth blog covering Qylur. 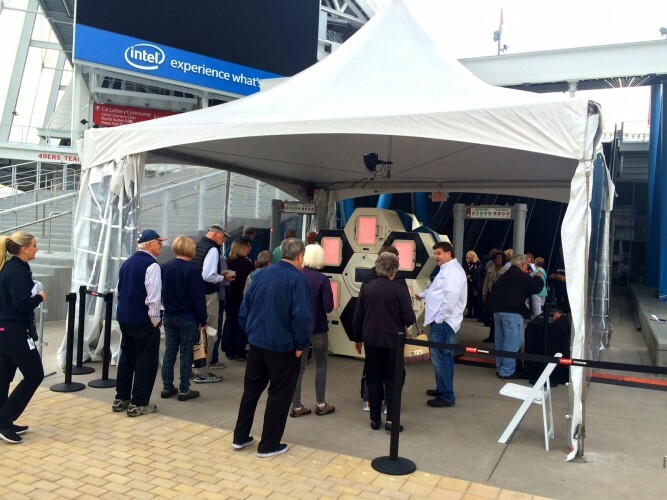 You can read further about Levi’s Stadium green sports tech in my iQ by Intel contribution. 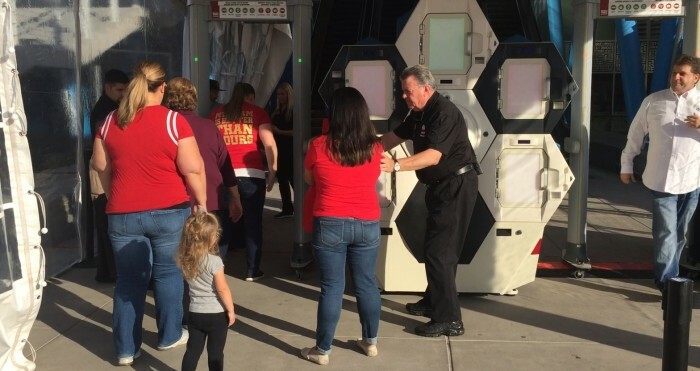 The Qylatron™ Entry Experience Solution is a heavily software based solution that now offers automated, self-service security-screening at Levi’s® Stadium for the organization’s daily tour program, select private events and the recent media day. The 49ers have partnered with the Silicon Valley innovator in order to streamline ticket checking with bag screening and ticket handling, while providing an additional layer of event security and improving the fan-centric guest experience for 68,500 fans expandable to 75,000 for major events. The wait time to get into Levi’s Stadium for ten home 49ers games, events like the WWE Wrestlemania 31 (attended by my bother and his family) and music concerts can be long but entry times are expected to be much lengthier for Super Bowl L on February 7, 2016. Qylur worked in tandem with Levi’s Stadium setting up the network and training screeners on touchscreens while improving the library of items for screeners in the form of custom icons that identify prohibited materials such as explosives, bombs and other dangerous items. The unit’s remote configuration allows for a control room operation that optimizes the combination of on-site manual searches and the Qylur system. During the training period info about what is inside of bags is learning by the machine improving the process every time it is used. The Qylatron is respectful of each citizen’s privacy, it also helps neutralize the uneasy feeling each fan has when their bag is checked and those of the guard that does the checking. Qylatron was designed for large venues in the private sector such as Levi’s® Stadium that is widely considered the most technologically advanced stadium in the world. Qylur’s Industrial Internet of Things (IIoT) technology harnesses the power of collective and adaptive learning through a social network of machines. “The concept was that to take different types of technologies, fuse them together, make them very smart, automatic, so that we can make decisions in a very quick amount of time, get a lot of people through,” Qylur founder and CEO Dr. Lisa Dolev said. Qylur delivers operational intelligence via adaptive learning and autonomous machines, enabling solutions with superior performance, exciting new capabilities and memorable user experiences. Utilizing “a social network of machines” that all communicate with each other and get smarter through machine learning (M2M), Qylur’s solutions offer guests a fun, respectful and personalized self-service process, while helping venues optimize operations and deliver great user experiences. In 2012, MetLife Stadium deployed the tech during pre-season football games before Super Bowl XLVIII won by the Seattle Seahawks. It was used again last year during the FIFA World Cup Brazil for all games at the stadium in Curitiba, for the entire duration of the World Cup event — screening tens of thousands. The deployment of one full sized, five-cell Qylatron at Levi’s Stadium marks the company’s first U.S. full-scale install. The company is in talks with a world famous major theme park in France making another possible Qylur client forthcoming. TSL’s evaluation will be the first step in in the CRADA collaboration between DHS S&T and Qylur. The DHS Transportation Security Laboratory (TSL) will study the Qylatron Entry Experience Solution as a secure entry point of the future, learning how the optimization operates in addition to further understand the machines ongoing learning AI. The DHS Science and Technology Directorate (S&T) establishes CRADAs as public-private partnerships designed to expeditiously mature and deploy security technologies. The TSL, part of DHS S&T, works with developers of contraband detection products so that systems might achieve qualification by DHS components. The 18-month-long collaboration will begin with the testing and evaluation of the Qylatron at the TSL facilities, a federal laboratory within the DHS S&T located at the William J. Hughes Technical Center in the Atlantic International Airport in New Jersey. The Qylatron will be evaluated for its new capabilities, operational models and detection. Qylur’s vision to provide the secure entry point of the future aligns with the DHS’s vision of smart, integrated, connected and interoperable solutions that deliver the experience and performance expected at airports and ground sites in the future. TSL’s evaluation will be the first step in in the CRADA collaboration between DHS S&T and Qylur. Security experts are speculating that the Islamic State group Paris attackers had studied fan entry into Stade de France and discovered that twenty minutes before the match was to begin, many fans emptied out of public transportation such as trains and walking routes knowing full well that the mass of humanity was sure to cause delays with ticket entry times. One suicide bomber tried using a ticket to gain entry into the football game but was stopped by a security guard check when guards at the gate suspected his vest looked suspicious. It turned out they were right as a propane tank and metal bolts were packed inside each of three explosive vests. Experts feel the suicide bombers goals were to blow up their bombs inside the stadium in hopes of killing and maiming fans in the surrounding area causing a stampede throughout the venue as people frantically tried to escape the facility leading to even more deaths and injuries. 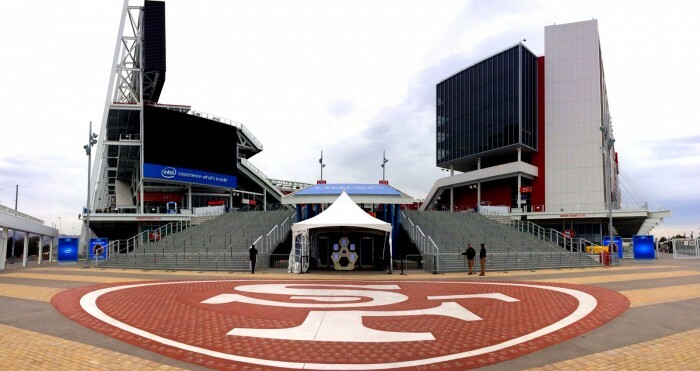 The 49ers have partnered with the Silicon Valley innovator in order to streamline the bag checking process, access validation and ticket handling while providing an additional layer of event security and improving the guest experience. Sports Techie, Qylar took different types of technology such as radiation and chemical sensors then fused them together in a smart, automatic way that allows for quick decisions in less time to get more people through. Qylur invented future technology today. The NFL issued a Public Safety announcement after the Paris Attacks last weekend stating, “Our procedures have been certified and designated by the Department of Homeland Security since 2008 as effective anti-terrorism technology. All NFL clubs use mandatory metal detector screening and multiple layers of perimeter security external to the stadium to safeguard fans and the stadium from explosive threats.” By communication with the DHS and the FBI, no known threats against NFL stadiums were identified. 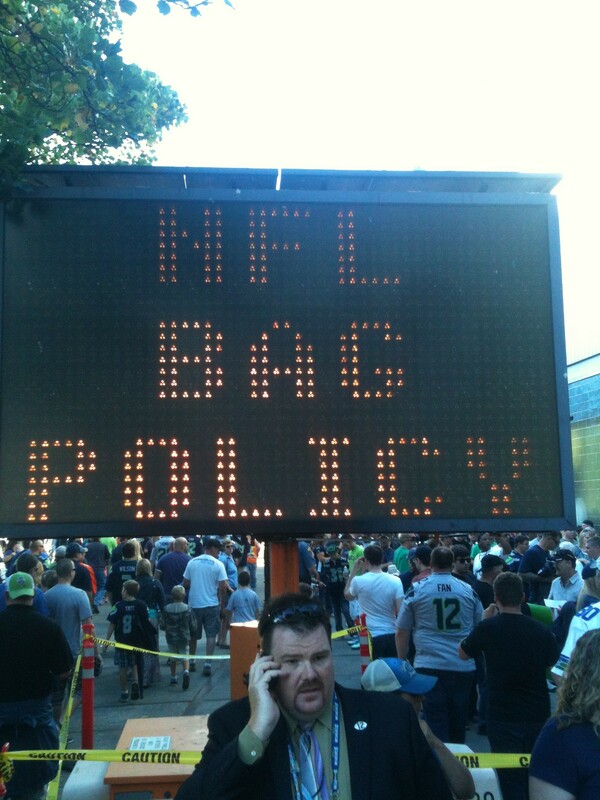 Seattle Seahawks Director of Guest Services, Tom Pitzer, spoke to the Sports Techie community blog about their new NFL No Bag Policy system. The obvious question is whether metal detectors and frisking are together enough to secure a venue or is more advance technology needed to stay a step or two ahead of ever increasing sophisticated terror threats. Nevertheless, security and law enforcement presence were placed inside and outside NFL stadiums in the parking lots. The NFL says they have been in contact with clubs hosting games to reinforce their standard procedures and the league’s best practices. Will the Qylatron be a part of those best practices in time for SB 50? I truly hope so. I asked Dolev about the new $1.5 billion Mercedes-Benz Stadium expected to open in 2017 here in Atlanta, home to the Falcons, the SEC Championship games and possibly Super Bowl in 2019. He said, “It sounds like the Levi’s Stadium has some competition.” No doubt about it. My question to Dolev as to whether the Qylatron was considered a sustainable product has not been officially answered as of yet. I was trained at Whittier College as a Political Science major to interview security task forces such as the FBI, sheriff and local police forces working across agencies so writing this blog after the Paris Attacks brings home the significance of the ground-breaking announcement by Qylur and the 49ers to collaborate long-term and how it affects us all over the world. Sports tech can help even the playing field but it can also save lives and time while creating a perfect mix of convenience and safety experience unmatched in the industry thanks to Qylur technologies and the brilliant brains that work on their intelligent ticketing and access validation as a complete process.